Painted Path: So Much to Share ! So Much to Share ! "What will happen to us today is completely unknown. Our commitment is to use it to awaken our heart." The Dove universally symbolizes innocence, gentleness, faith, marital affection, peace and constancy. The deepest kind of Peace and Faith is symbolized by the Dove. It's image stills our worried and troubled thoughts, and shows us how to find renewal in the silence of our minds. In such moments of stillness, we are able to appreciate the simple blessings that go unnoticed in the chaos that surrounds us each day. Finding renewal in the silence of our minds--I love that. I continue to be in absolute awe of the creative process. The fact that this Dove came through, without my needing to make it happen or control the process at all, brings me so much peace and solidifies my faith in...in, well, pretty much everything. Despite the cold from hell that I've just decided is on its way out, I feel a gentle peace settling in. The air is oozing with possibility right now...I can feel it all over. Now, a few more things to share! 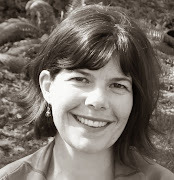 Issue # 3 of Sprout, the new online magazine created by Amanda Fall, is out! 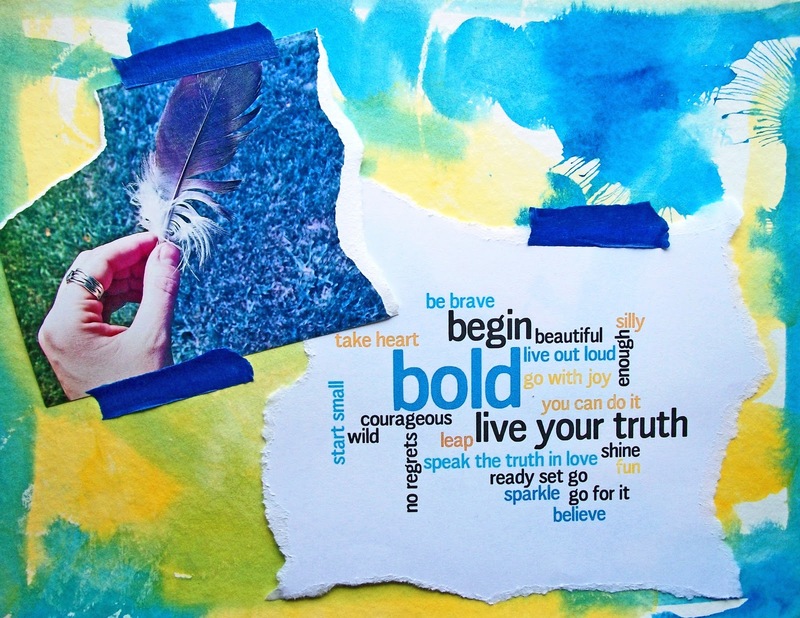 This issue's theme is BOLDNESS and it's seriously incredibly inspiring. There's gorgeous art, poetry, essays, photography, prompts...so so much to nudge you awake and stir the senses. I feel so honored to have my poem Unleashed in this edition. You can click here to download one for yourself. I'm in love with the above words (found in this month's issue of Sprout). One more thing! Beautiful J and I (and so many others) are having an absolute blast with our 6-word days. Below are our words for day 3. If you want to play along with us (come on, it's seriously fun!) head here and leave your words. I'm so enjoying doing something just for the fun of it--so refreshing. Julia: Taking NyQuil and going to bed. j: I think I’m stealing Julia’s energy. 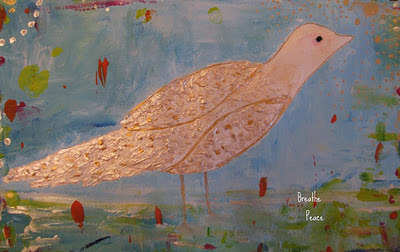 i'm in lovedove with your dove painting, julia! + i too love sprout + amanda + congratulations on your poem being in there!! + your opening quote is amazing! Rachel...it just occurred to me what a perfect last name you have. You have a way of always leaving me feeling awed. I just love you too. Lots of awesomeness, my friend! Love your sweet dove! And all this when you are sick as a dog! Right on! Oh, and I am feeling the need to add my six words--Sprinkling wishes into magical wishing jar! Sprinkling wishes...that sounds so pretty. Your support means everything, Brooke-thank you. Filled with relief--the deadline met. Miriam...thank you for these words--they feel like a healing balm. p.s. I love your dove! J, I totally adore you. So happy we get to play together. Thank you, dear friend, for this beauty. I love you. Alia, you're here! I love having you here. That dove makes me crazy I love her so much. I love the creative spirit. I love that you made a dove and your word is peace. She came as a gift to you. Yes, she feels like a gift, Lori. And so do you. Your dove is beautiful. So magical that she is golden. I love the space you've created here. Have a relaxing and healing weekend. my friend. Eydie...thank you. The whole process of painting her felt pretty magical. I used this shimmery effervescent paint that I've decided I'm absolutely in love with...have you ever used that stuff? You'll be hooked! I so appreciate your presence here. And I love that you love your new haircut!